Der Artikel Wardatul Akmam: Arsenic Mitigation in Rural Bangladesh wurde in den Warenkorb gelegt. Ihr Warenkorb enthält nun 1 Artikel im Wert von EUR 98,56. Introduction.- E-mail Interviewing of Experts on the Cause of Contamination.- Social Survey in the Study Area.- Available Safe Water Options.- A Model for Attaining Guidelines to Select Optimal Safe Water Option(s) and to Specify Their Locations.- Simulation Results.- Mechanisms to Convince People to Adopt Safe Water Options.- A System for Providing Safe Water.- Social Survey in Taranagar (2005).- Conclusions, Appendices. 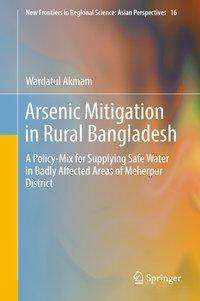 Based on micro-level empirical research, this book uniquely addresses the problem of arsenic contamination in ground water in Bangladesh in a comprehensive way. At the outset, the book puts forward the opinions of experts regarding the cause of arsenic contamination in ground water in Bangladesh, followed by sample surveys depicting socioeconomic and arsenic-related situations in three arsenic-affected villages in Meherpur district, Bangladesh. The major contribution of the author is the mixed-integer Pareto optimality model (tested and proved through computer simulation), developed in order to supply safe water to the badly affected people in Taranagar village. The model takes into account such issues as the costs of different safe water options, exposure to arsenic and bacteria, distance of the water source from home, indigenous cultural traits, environmental safety and acceptability of the options to the people. Besides successful development and application of the model, the book outlines ways to persuade people to change their habits regarding drinking tube-well water and proposes a system through which safe water can be supplied to Taranagar village. The book emphasizes socioeconomic, environmental and administrative aspects of selecting an optimal safe water option and ensuring consumption from safe water sources, which can be tested for other arsenic-affected areas as well. With relevant, attractive charts, tables, graphs, flowcharts and other graphics and with lucid language, the book makes rather difficult theoretical economics issues easily comprehensible and interesting to general readers, graduate and undergraduate students, researchers and NGO/GO workers who are dedicated to providing safe water to people affected by arsenic contamination.